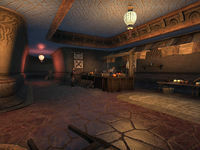 Farmers and Laborers Hall is the grocer located in Vivec City. It is located within the Saint Olms Waistworks, in the northeast corner. The banner outside both entrances is labeled "Brewers and Fishmongers Hall". ?